This title will be auto-delivered to your Kindle on 1 August 2019. 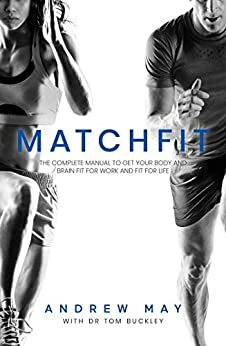 MatchFit is the complete guide to getting your body and brain in the best possible shape for work, and for life. This inspiring book is the culmination of Andrew May’s twenty years of experience as an elite athlete and fitness trainer for some of the world’s best athletes; studying the body (Exercise Physiology) and the brain (Coaching Psychology); working with a variety of clients including elite athletes, military, entrepreneurs, business leaders and entire organisations; and life experience. The Matchfit principles will help you better manage your diary and plan for what is important; build your ability to cope with pressure and have more resilience; support you in improving health and fitness levels; learn all about what’s new in nutrition; the importance of being connected and building in play; and freeing up time and energy to invest in family, fitness, and personal interests. Matchfit has the capacity to make a real difference to the way you CONNECT, FUEL, MOVE, THINK, RECHARGE and PLAY. And there is a process in the program to keep you accountable and support you along the way. Andrew began his career as an elite middle distance athlete before studying exercise physiology and sports coaching, he then went on to complete a Masters in Coaching Psychology and has recently started his PHD. He worked as the Physical Performance Manager for the NSW and Australian Cricket teams, the Sydney Swifts and NSW netball teams, as well as with basketball, AFL, tennis and Olympic athletes. Andrew produces a popular podcast (Andrew May Podcast) and is the author of bestselling book Flip the Switch. He has a regular segment on ABC News Breakfast and appears on TV, radio and in the press. He delivers energetic and inspiring keynote presentations around the world.